Will you be my sweet potato? Posted 10/1/2017 7:15pm by John Eisenstein. 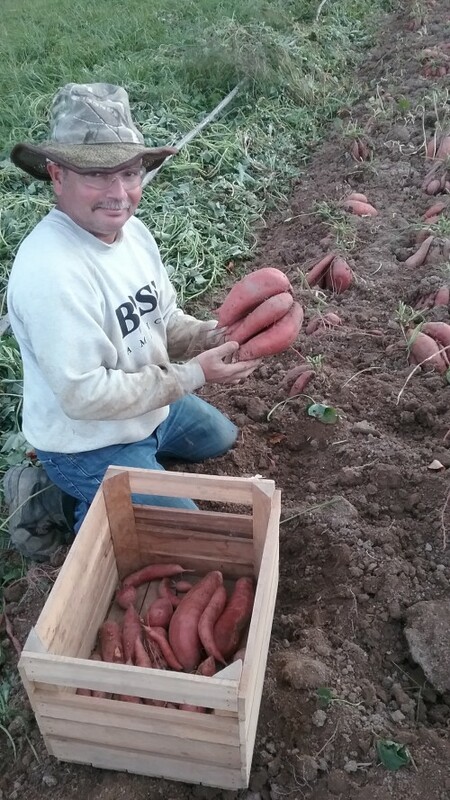 Lets's start by explaining the difference between sweet potatoes and yams. Botanically speaking, they are utterly different. 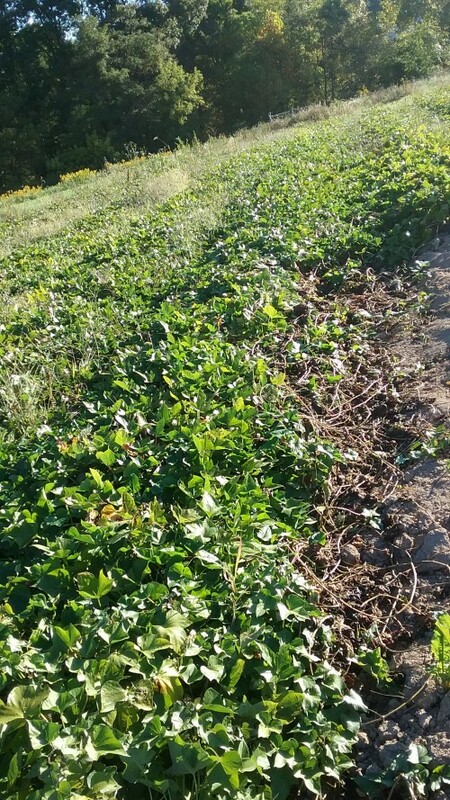 Yams are not a type of sweet potato, and sweet potatoes are not a type of yam. 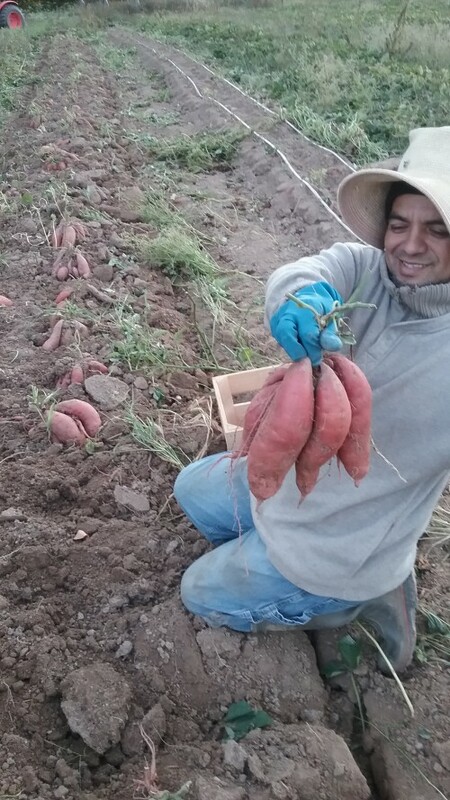 Yams grow only in tropical areas, with a 300 day growing season, get to be very large (up to 4 1/2 feet long and 130 pounds! ), and taste very different than sweet potatoes. They are related to lillies. Most people in the United Stated have never seen or eaten one. Most grow in Africa, where they are native, although they are also popular in Jamaica. 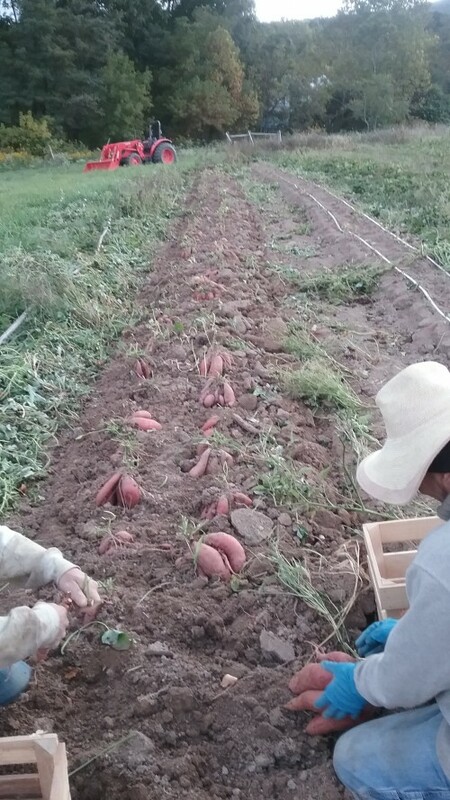 Both Angel and Juan help plant the "slips", as young sweet potato plants are called, and it is a long season and a lot of work to care for, so it's no wonder they are pleased. Not pictured is the crew who spent many hours weeding the plants during June, July, August and September-- Matthew, Ella, Charles, Suzie, Stella, Jose, Evelyn, Jim and myself. I know it sounds like I have a lot of employees, but half the above named are relatives-- which means I don't pay them, so technically they aren't employees-- and nobody is full time. Except me. 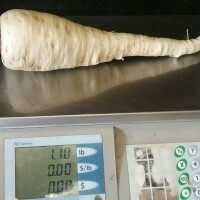 It weighs 5 1/4 pounds. Directions: cut up sweet potatoes and put into a pot of water. Bring to a boil and boil until soft. Remove sweet potatoes from the pot, mash with a fork, and add butter and salt. I don't spend much time cooking but I know what I like! 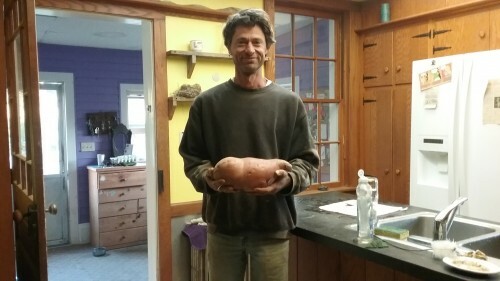 By the way there is no need to peel a sweet potato, ever.